ISLAMABAD, Pakistan (CNN) -- Suspected Taliban militants early Saturday staged another attack against cargo terminals in northwestern Pakistan in the country's restive tribal areas, destroying NATO supplies bound for neighboring Afghanistan, police said. 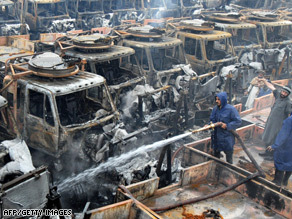 Firefighters extinguish smouldering trucks after a recent attack on a Peshawar terminal. Military vehicles and food in 13 containers were thought to have been destroyed in the attacks outside the frontier city of Peshawar. It follows at least five other attacks against NATO and U.S. supply lines in recent weeks. Militants threw petrol bombs into the city's World Logistic Terminal and the Al Faisal Terminal, police said. The terminal holds hundreds of supply containers as well as Hummer transport vehicles bound for Afghanistan. Several containers were still burning by Saturday afternoon. Peshawar Police Chief Sifat Ghayor he would now post police and the frontier constabulary at the terminals to protect them. In a similar attack on November 11, as many as 200 Taliban fighters hijacked a NATO supply convoy from the port of Karachi to Afghanistan via the border at Peshawar. The militants took two Hummers and paraded them as trophies. The accused Taliban mastermind of that attack, Mustafa Kamal, was arrested Thursday in Peshawar, security sources said. An Afghan also known as Yahya Hijrat, Kamal is a close friend of Baitullah Mehsud, leader of Pakistan's Taliban. In September, sources said Mehsud had died, but it remains unclear whether that's true. The World Logistics Terminal was also attacked Thursday evening when several explosions sparked a fire that engulfed and destroyed at least three trucks, two cars and at least eight containers. -- CNN's Zein Basravi contributed to this report.